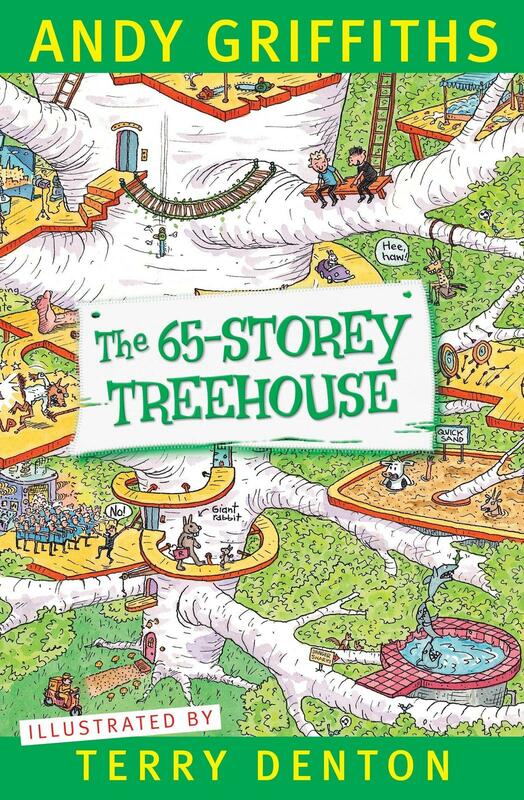 The 65-Storey Treehouse is the fifth book in Andy Griffiths and Terry Denton's wacky treehouse adventures, where the laugh-out-loud story is told through a combination of text and fantastic cartoon-style illustrations.Andy and Terry's amazing 65-Storey Treehouse now has a pet-grooming salon, a birthday room where it's always your birthday (even when it's not), a room full of exploding eyeballs, a lollipop shop, a quicksand pit, an ant farm, a time machine and Tree-NN: a 24-hour-a-day TV news centre keeping you up to date with all the latest treehouse news, current events and gossip. Well, what are you waiting for? Come on up! Did you know that the people who made the book put a nether 13 storey every book. I think that this is a amazing fables book. Left at a place on the West Tamar where learning occurs – lots of books found here. Really enjoyed this series – Andy Griffiths books are always entertaining. How high would 65 storeys be? How many storeys is the highest building in the world?